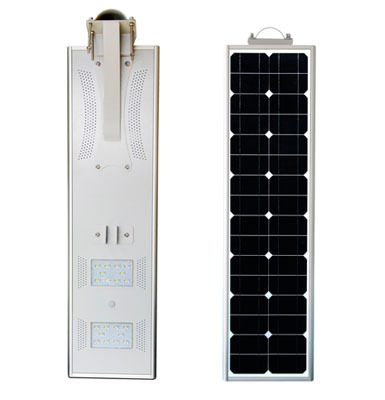 The 20W all in one solar street light uses solar energy to work, and the accumulator in it can transform the solar energy into electric energy. 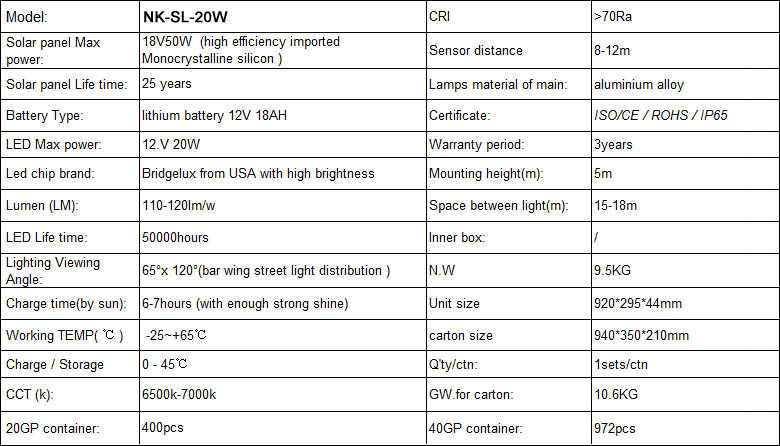 The led light source with high brightness, long service time Li-battery and the human body detector module are adopted in the new product. 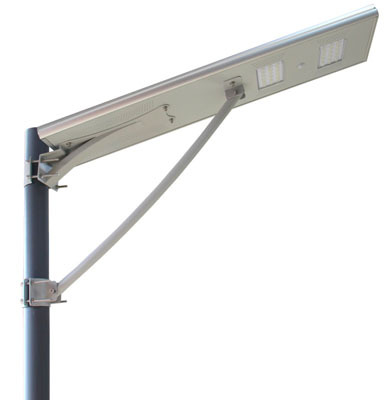 And the all in one solar street light has the advantages of energy saving, long service life and integrated installation and maintenance. 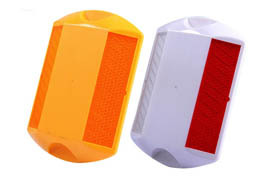 The intelligent human body detector system has infrared sensor on it, and when people come closer, the light will be give out full light, however, when people leave away, the brightness will be cut down to 1/3, which can save energy effectively. 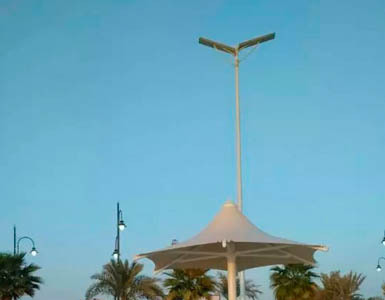 Compared with the ordinary street light, the integrated solar power light has the advantage of wiring-free and electric charge-free, and it has fashionable and simplified outlook. 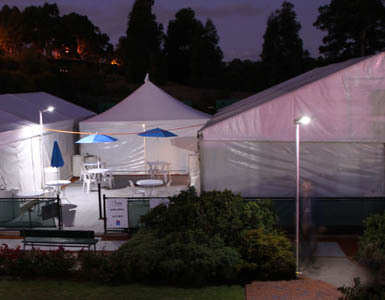 It is energy saving, environmental friendly, easy transportation and easy installation. 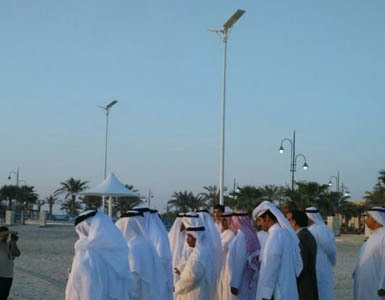 The integrated solar street light can save a large number of expenses on installation, testing and transportation, and the expense of it is only 1/5 of the traditional solar street light. 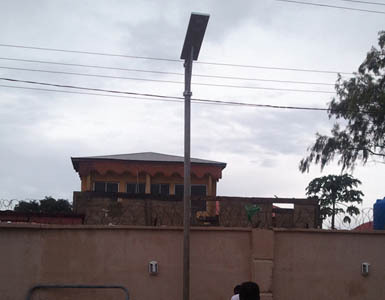 If the light is exported abroad, the expense is only 1/10 of the traditional ones. It can work in the temperature of -40℃ to 60℃, and the battery active can reach 80%. The overcharge and over-discharge protection can give full protect to the accumulator, and the working time can reach 5 years. Expressways; auxiliary roads; paths of residential areas; Courtyard; parks; parking lots;parks. 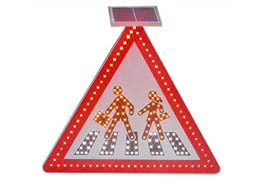 NOKIN ranks in the leading position in the field of traffic safety for more than 15 years. The products of it have been exported to many countries, including America, Costa Rica, Chile, Philippines, Japan, Russia, Ireland, Mozambique, Australia, etc. All the clients of NOKIN speak highly of the products. NOKIN has a set of service procedure, and it can not only provide the road studs, solar street light, and other products to satisfy your needs, but gives you wonderful after-sales service. You can contact us through e-mails.